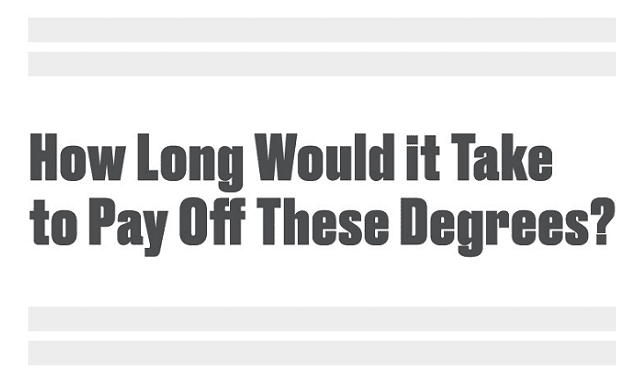 How Long Would it Take to Pay Off Student Loans by Degree? #Infographic ~ Visualistan '+g+"
As most college graduates in America can attest to, student loans are a significant roadblock to achieving financial and personal goals for many years after graduation. While the conventional wisdom has been that a person typically repays their tuition and other student loan costs within 10 years, often this timetable is unrealistic in practice. For example, even a top executive, earning more than $100,000 a year, can take more than 22 years to pay off an MBA. Similarly, a top software developer may need more than 16 years to repay their B.S. in Software Development. Which career paths have better tuition-to-salary ratios? That would be dental hygienists, registered nurses, and electrical engineers, among a few others. For example, a dental hygienist may be able to pay off their student loans within 6 years. This infographic from Massachusett's Career GPS (Which can be found at CareerGPS.Mass.edu) explores 15 popular college degrees, and the average amount of time it takes a person to pay off those student loans, based on the degree and salary earned upon graduation.